What is a Jelly Roll Race Quilt? 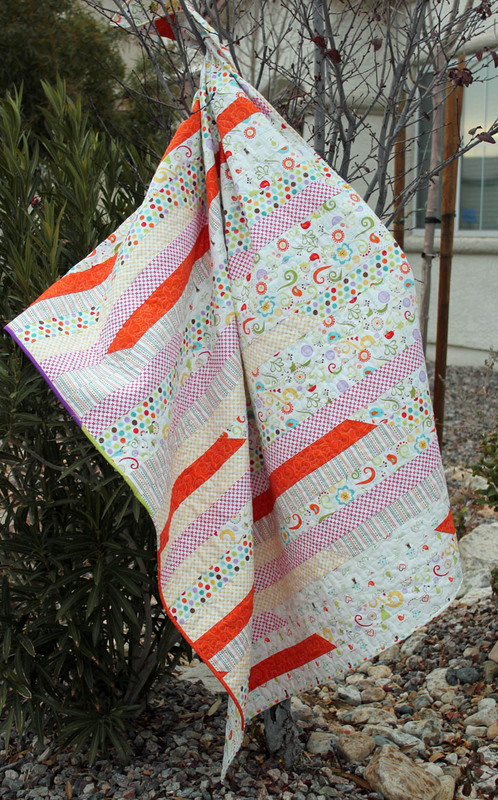 A Jelly Roll Race Quilt, also known as a Lasagna Quilt is traditionally made with a bundle of pre-cut strips. These strips are 2.5" x WOF (Width of Fabric - usually between 40-42"). There are traditionally 40 strips used in a quilt. The strips are sewn end-to-end, usually with a "mitered" seam, meaning that the strips are sewn at an angle to eachother. Sewing the mitered seam adds interest to the finished quilt. The finished quilt often looks more cohesive if the strips are sewn together in a completely random order, rather than in the order they appear in the bundle. 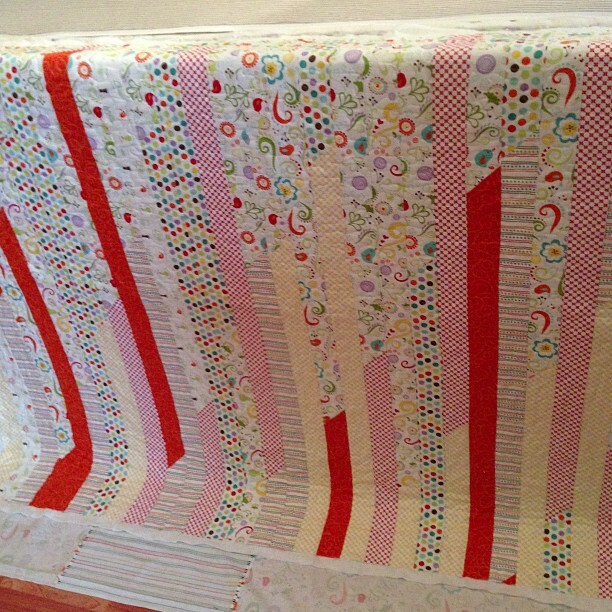 Once all the strips are sewn into one very, very, very long strip, 18" is cut off of one end. This is very important - it is what creates the random placement of the strips. Press all the seams in your preferred way - either open or to one side. The strip is now prepared, and ready for the race! The strip is then folded in half, right sides facing, with both of the short ends touching, and is sewn from one end to the other using a 1/4" seam allowance. This takes a LONG time. Typically between 60-90 minutes. Yes, a LONG time. Once the seam reaches the folded end of the strip, the fold is cut, and the process is repeated. The strip is folded in half, right sides together, and stitched from end to fold. This process repeats a total of FIVE times. Each time it takes only half as long to sew down from one end to the other, so the process speeds up significantly. 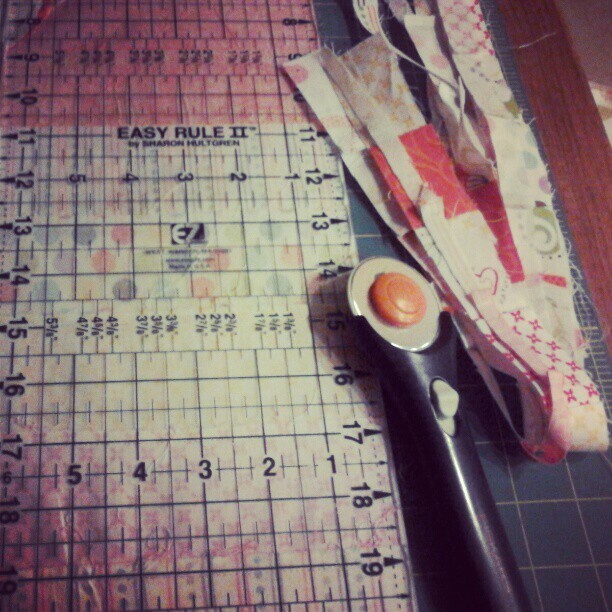 Once the final fold is cut, the seams can all be pressed in the same direction, and the quilt top can be trimmed up! ... ready to be quilted! Make a Jelly Roll Race Quilt: Video!